With BlackBerry 10, Research in Motion is trying to get its once-iconic phones back into a market that has left it behind. Apple essentially invented the modern smartphone market in 2007 when it launched the iPhone, but Google's Android has quickly reshaped the entire field. Google (GOOG) rocketed from literally nothing in 2007 to the No. 1 position in 2011. Nearly half of the smartphones that shipped that year ran on Android, according to estimates from ABI Research. And Android's lead grew further last year. 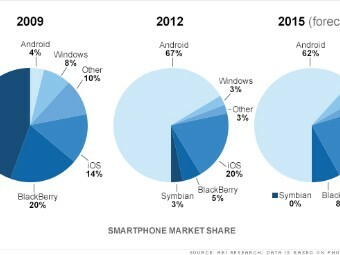 In the process, Android blew out the former champ, Symbian. Now nearly forgotten, Symbian was the primary mobile operating system used by Nokia, Samsung, Motorola and Sony throughout the mid-2000's. The battle now is a fight for the No. 3 spot. Microsoft's Windows Phone and RIM's BlackBerry 10 seem the best positioned to grab it, but analysts have wildly differing views on how successful RIM and Microsoft will be. ABI thinks RIM will outpace Microsoft in the long run. It sees BlackBerry 10 with 3% of the market share this year, versus Windows Phone's 5% share. But by 2016 ABI believes BlackBerry 10 will pass Microsoft, with 8% of the market, compared to a 5% share for Windows Phone. Research firm IDC is more bullish on Microsoft. It thinks Windows Phone will grab 11% of the market by 2016, with BlackBerry trailing behind at 4%.